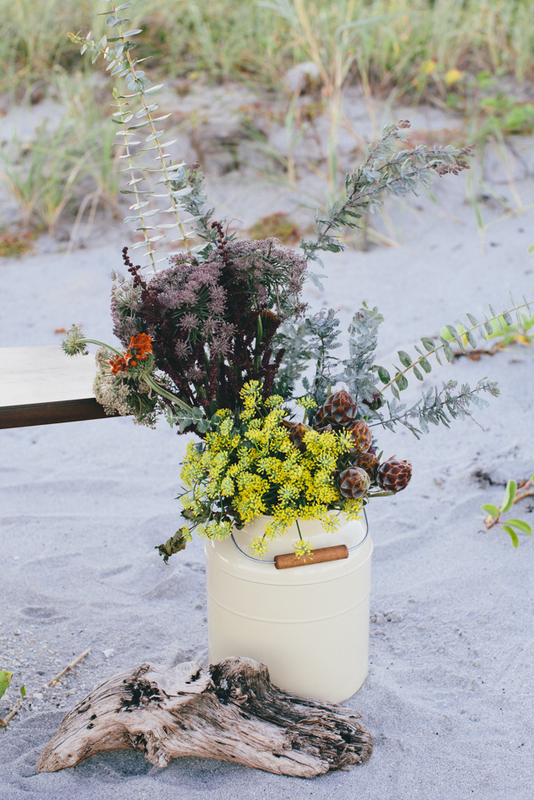 When styling a tablescape I like to keep 3 things in mind: levels, function, and cohesion. Levels keep your eyes moving and interested, while creating opportunities to incorporate eclectic pieces of varying heights. Function can be easily lost when trying to incorporate too many pieces, but the function of a table is key, remember what the main purpose of a table is, and from there style a functional tablescape. Cohesion is often times confused with matching. Cohesion does not mean that if the plate is blue then the flowers must be blue and the votives must also be blue. It is rather the opposite. I like to pull colors from different pieces and have them reappear in other pieces. For example, the plates have a pattern of orange, blue, pink and yellow flowers. By incorporating those colors in a few of the centerpiece's flowers a sense of cohesion is created and they are now all able to work together, while remaining very different. 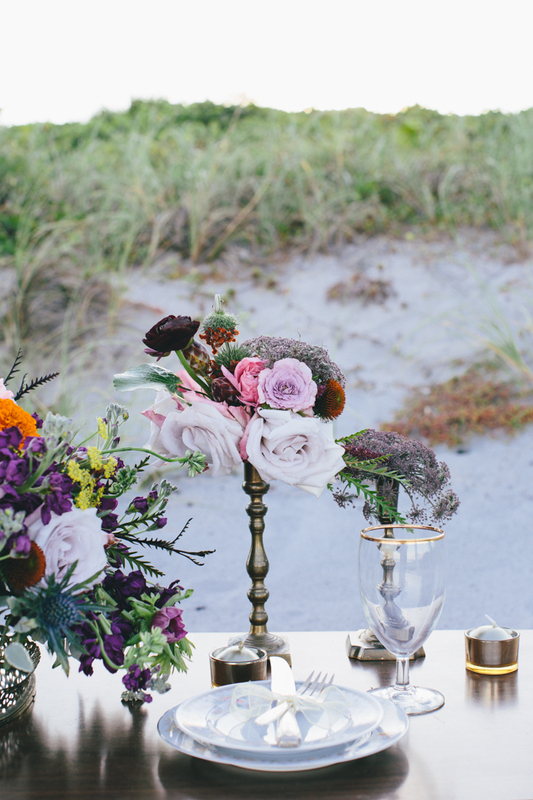 When styling this bohemian tablescape it was important that it is polished but wild and overgrown, bold but muted and natural. There needs to be a balance. Going bold with the floral arrangements meant that we could keep the table itself bare of any linens. Having polished bronze candlesticks meant that we could top them with overgrown wildflowers rather than tapered candles. 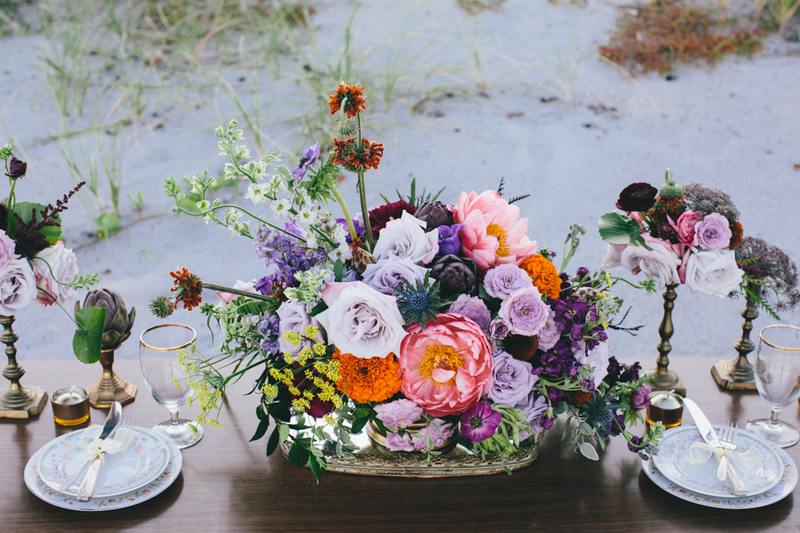 I imagine this bohemian tablescape would be perfect for a couple looking to elope. It could easily function as the sweetheart table at an intimate and non-traditional reception accompanied by floor pillows or a woven wool blanket. Word of advice: no amount of candlesticks or patterned china will make you smile quite like a handcrafted floral centerpiece. Never cut the floral budget out of your wedding, the real beauty comes when a thistle becomes fast friends with a peony and a rose.